This is a simple project I’ve been working on during the weekends lately. 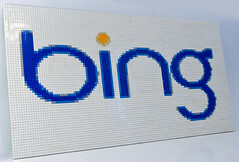 It’s the Bing logo done in LEGO plates. I’ll be moving it into my office soon. It took maybe 6 hours of work and is about 3.4ft (1m) wide. This entry was posted in lego and tagged Bing, lego, microsoft on October 24, 2009 by Ben.